BRAD WEISMANN: From Senses of Cinema -- Kurosawa's "Scandal"
From Senses of Cinema -- Kurosawa's "Scandal"
Shubun/Scandal was the final film legendary director Akira Kurosawa made before catapulting to international fame with Rashomon (1950). As such, it is a waypost that points both to the past and to the future in the director’s work. This uneven yet vital offering chafes uncomfortably against its genre conventions while it offers moments that presage Kurosawa’s glorious output to come. Scandal, his tenth film, neatly demarcates the first third of Kurosawa’s directorial career, an apprenticeship that began in 1936 (1). It had taken a few years after World War II’s end for Kurosawa to move out from under the shadow of the censorship imposed by both the Japanese authorities and those of the American Occupation. Scandal, ironically, would focus on the dark side of newfound freedoms, specifically the freedom of the press. Kurosawa created a trio of gritty, hard-hitting, socially conscious dramas – Yoidore tenshi (Drunken Angel, 1948), Shizukanaru ketto (The Quiet Duel, 1949) and Nora inu (Stray Dog, 1949) – just prior to Scandal. 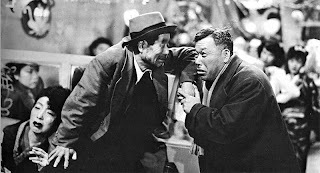 All three films featured the signature acting presences of Toshiro Mifune and Takashi Shimura (and Scandal would be the eighth Shimura/Kurosawa collaboration). These two remarkable performers would maintain positions at the centre of Kurosawa’s repertory company for years to come. Critically, Scandal has frequently been dismissed as a “courtroom potboiler” (2), a “curiously unbalanced film” (3), and a “sentimental melodrama” (4). Yet a look with fresh eyes reveals a divided but still powerful cinematic document, a hybrid of pessimistic social critique and redemptive fable. The film begins in the countryside in winter. “You an artist, mister?” is the first line of dialogue, spoken by one of a comic trio of country bumpkins as they watch the protagonist, Ichiro Aoye (Mifune), paint the mountain landscape in front of them in a decidedly non-representational manner (he later refers to comparisons of his work to that of Maurice Vlaminck, the early-20th-century Fauvist painter). Aoye is the stereotype of the bold, noble, two-fisted avant-garde artist (reflecting, perhaps, Kurosawa’s own background in art), right down to his pipe and motorcycle. Aoye is on his way to a mountain spa. A beautiful voice draws the men’s attention, and mounting the hill and emerging into the frame is Miyako Saijo (Yoshiko “Shirley” Yamaguchi), a prominent singer on her way to the same destination as Aoye, who offers her a lift on his bike. This innocent favour is spotted by two journalists for the gossip rag Amour, who then trail the duo to the resort and snap photographs of them that make them appear to be involved sexually with each other. Once the unscrupulous paparazzi have gotten their “scoop”, the scene shifts permanently from open-air pleasures and simple artistry to the gritty city streets and entanglement with the law. The plot cranks along predictably. Amour goes to press with its faux-expose, “Love on a Motorcycle”. Aoye sees a wall plastered with his and Saijo’s image, putters over to the magazine’s shabby offices (the chicken-wire interior walls reinforce the viewer’s sense of entrapment), and punches out the publisher. Soon we are exposed to a wry Capraesque back-and-forth, as publisher and artist issue salvoes at each other to an ever-growing crowd of reporters and cameras. Still, bits of Kurosawa magic leap out at us. Aoye decides to sue, but can’t convince Saijo to join him. In two beautiful shots, Aoye’s hand snatches up his goggles and gloves, and then he powers away from our point-of-view, sailing in a serene downhill curve parallel to a set of streetcar tracks. 25 minutes into Scandal we meet the character that, according to many critics, derails the film (7). Takashi Shimura plays Hiruta, a weak and self-loathing shyster who looks up Aoye in his drafty, Bohemian studio in the hope of taking up his case against the magazine. “Even scoundrels know the law”, he says, foreshadowing his betrayal to come. Hiruta leaps out at the viewer for two reasons – one, the magnificent and nuanced performance by Shimura, and two, the relatively flat characterisations that surround him. Kurosawa has dropped a real human being into a forest of cutouts, and Hiruta begins to run away with the picture. Kurosawa cites his inspiration for Hiruta in a man he met in a bar years before – a figure with a bedridden, tubercular daughter who went on and on about his unworthiness compared to her (8). Hiruta, too, has a sickly, saintly child, who Aoye meets inadvertently. Her state convinces him to hire Hiruta. But Hiruta is soon seduced by Amour’s publisher into taking money to throw the case. In a shot that neatly parallels that of Aoye’s earlier departure on his motorcycle, a drunken Hiruta, loaded with ill-gotten gifts, is returned to his ramshackle house in an Amour distribution truck. In a lengthy scene, Hiruta attempts to hide this latest moral slide from his daughter, but her tuberculosis seems to have given her psychic powers. Soon Hiruta is babbling his confession to her – “In order to stay undeceived, I had to start deceiving others” – until he passes out at her bedside. Through to the end of the film, the battle between the by-the-numbers suspense plot and the story of Hiruta’s suffering continues. Clichés such as Hiruta guiltily turning his daughter’s picture to the wall in his office, or a tearjerking scene in which Aoye and Saijo give Hiruta’s daughter a splendid Christmas concert, are interspersed with inspired moments. The sprightly sequence of Aoye’s delivery of a fully decorated Christmas tree to Hiruta’s home on his motorcycle, and the despairing face of Hiruta peering through his own window, his dying daughter’s smiling face reflected in the pane, are marvellous. Later, Hiruta and Aoye make a drunken expedition to a local dive. (A jab at the influx of American influence is made when the scene opens, with patrons singing “Buttons and Bows”, a top American pop song of the day.) There, stalwart Kurosawa regular Bokuzen Hidari (best known as sad-sack villager Yohei in Shichinin no samurai [The Seven Samurai, 1954]) plays a drunk who speaks of the New Year with a slurred resolve to change his ways. Soon, he and Hiruta and the rest of the bar’s inhabitants break into “Auld Lang Syne” as the camera gracefully swoops round them. Critics such as Donald Richie see this and other aspects of the film as dry runs for Kurosawa’s subsequent masterpiece, Ikiru (Living, 1952) (9). The soused duo then stumble back past a pond near Hiruta’s home (a call back to the polluted urban fen that plays a central symbolic role in Drunken Angel). The water reflects the starry sky – a quietly miraculous shot that foreshadows Hiruta’s redemption, at least until he yells “Merry Christmas!” for the eighth time and passes out at its verge. The movie then returns to a tone of business as usual. The trial progresses. It turns out that Aoye, at least, knows that Hiruta is cheating him, but hangs on to give him a chance to prove himself. The sudden off-camera death of Hiruta’s daughter pushes him to reveal his complicity with the defendant, saving the day for his slandered clients at the cost of his career and reputation. One scandal drives out another. Indeed, the upbeat Hollywood-style conclusion – Aoye states to yet another gaggle of pressmen after the trial that Hiruta’s redemption means that “a star came into existence” – is undercut by the final sequence. Hiruta plods forlornly past the pasted-up handbill images of Aoye and Saijo, now torn and tattered. He is as forgotten as all the fuss that blew over him. Kurosawa’s crusading effort ultimately came largely to naught (he states that “Scandal proved to be as ineffectual a weapon against slander as a praying mantis against a hatchet”) (10). However, Shimura’s agonised, over-the-top portrayal of Hiruta sets the stage for his more restrained and more affecting performance as the similarly meek bureaucrat Watanabe in Ikiru two years later. Scandal combines several key aspects of Kurosawa’s cinema: his social conscience, his magnificent eye, and his feel for character. All the elements, unblended, are there. That it does not hang together seamlessly makes the quantum leap he made with Rashomon all the more astonishing. Stuart Galbraith IV, The Emperor and the Wolf: The Lives and Films of Akira Kurosawa and Toshiro Mifune, Faber and Faber, New York and London, 2001, p. 29. Michael Koresky, “Eclipse Series 7: Postwar Kurosawa”, The Criterion Collection: http://www.criterion.com/current/posts/627. Donald Richie, The Films of Akira Kurosawa, 3rd ed., University of California Press, Berkeley, Los Angeles and London, 1996, p. 69. Mitsuhiro Yoshimoto, Kurosawa: Film Studies and Japanese Cinema, Duke University Press, Durham, NC, 2000, p. 180. Akira Kurosawa, Something Like an Autobiography, trans. Audie E. Bock, Vintage Books, New York, 1982, p. 177. Stephen Prince, The Warrior’s Camera: The Cinema of Akira Kurosawa, Princeton University Press, Princeton, NJ, 1991, p. 75.